As a group of people who hate sitting still- yes, even when House of Cards has been updated on Netflix- it's mandatory that we take advantage of super cool weekend invites. 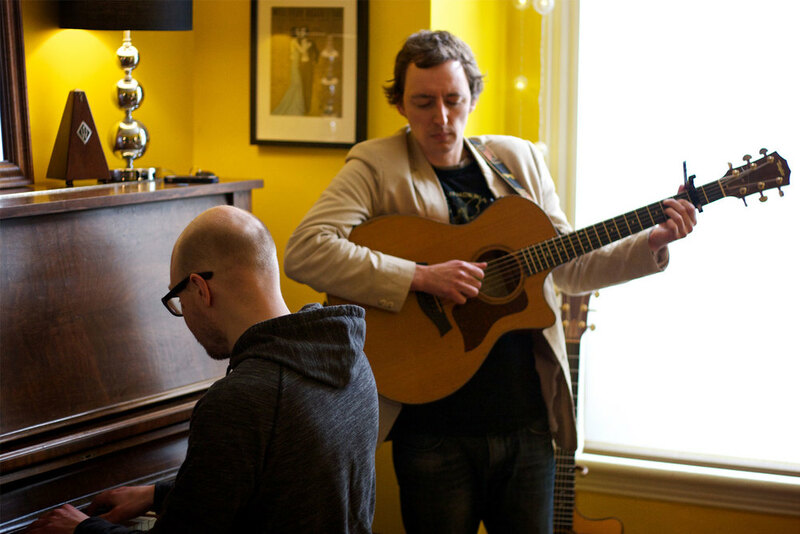 This past Sunday, we were thrilled to be a part of the Maisonneuve Music House Concert celebrating a year since their birth as a record label. The event was hosted by label owner, Kathleen Farley and the talented Michael Chambers in their beautiful Hamilton home. Greeted with smiles, hugs and full house, we knew we'd be in for a fun afternoon of music. First up, Emilio Bonito showcased his talent on the guitar, playing beautiful original material, combining his fast picking with soft melodies. He, along with musician Dustin Jurkaulionis, played through their tracks, with the crowd silently toe-tapping along. After a short break, allowing us to enjoy the amazing spread of local beers, and homemade nacho dips, it was time for Ann Arbor's Mike Vial to take the stage. Before the show, I had one guest ask, "Do you know Mike, how would you describe his style?" He's a singer-songwriter who really knows his way around a guitar, was my response. I felt I could have done this talented man more justice with my intro, but as soon as he started to play, I was reminded that I was spot-on with this description. Mike is a dear friend of PTP, having previously recorded a few tracks for us to use in frequent rotation on our podcast. Hearing him play live again, with new material added to his ever-growing repertoire of songs, is a real treat, though we loved hearing old favourites that we could sing along to. (Mike, I think you may have noticed me singing along way in the back!) Check out his full setlist here!! A highlight of the set came when Michael Chambers joined Mike on piano for Made a Mess and Love Birds. I could have listened to them play all day. Mike is a rare find in that he can captivate an audience with his stories as equally as he can with his music, combining his anecdotes with engaging tracks. A huge thanks to Kathleen and Mike for welcoming us into their home and to Emilio and Mike for sharing their talent with us. Stay up to date with Mike at his website, and access his entire music library with this awesome subscription!